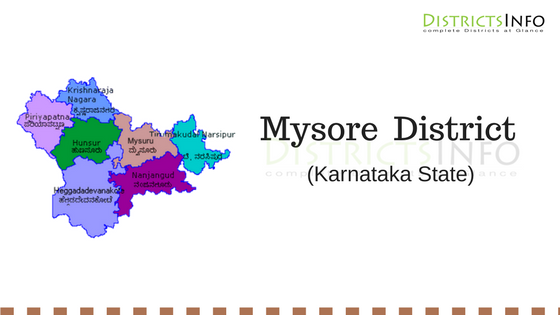 Mysore District With Talukas: Mysore officially renamed as Mysuru, is the third most populous and the third largest city in the state of Karnataka, India. Located in the foothills of the Chamundi Hills about 146 km southwest of the state capital Bangalore, it is spread across an area of 128.42 km 2. Mysore served as the capital city of the Kingdom of Mysore for nearly six centuries,, from 1399 until 1956. The Kingdom was ruled by the Wodeyar dynasty, with a brief period of interregnum in the 1860s and 70s when Hyder Ali and Tipu Sultan were in power. Patrons of art and culture, the Wodeyars contributed significantly to the cultural growth of the city and the state. According to the provisional results of the 2011 census of India, Mysore had a population around 9 lakhs. Mysore has an average altitude of 770 meters or 2,526 ft. It is spread across an area of 128.42 km 2 at the base of the Chamundi Hills in the southern region of Karnataka. Mysore is the southern-most city of Karnataka and is a neighboring city of the states of Kerala and Tamil Nadu in the south, flanked by the state cities Mercara, Chamarajanagara, and Mandya. People in and around Mysore extensively use Kannada as a medium of language. Mysore has several lakes, such as the Kukkarahalli, the Karanji, and the Lingambudhi lakes. Mysore has a tropical savanna climate designated Aw under the Köppen climate classification. Mysore is connected by National Highway NH-212 to the state border town of Gundlupet, where the road forks into the states of Kerala and Tamil Nadu. State Highway 17, which connects Mysore to Bangalore, was upgraded to a four-lane highway in 2006. Mysore railway station has three lines, connecting it to Bengaluru, Mangalore, and Chamarajanagar. Mysore Airport was modernized in the mid-2000s, reopening to scheduled passenger service in October 2010. Also, it has some great institutions for students to continue their higher studies.